McGraw-Edison Marquis LED Sign Light named the winner in the Roadway, Sports, Outdoor Architectural and Site Lighting category. HOUSTON, July 22, 2011 - Cooper Lighting, an industry leader committed to delivering innovative products and driving transformational technology in the lighting industry, is proud to announce the McGraw-Edison Marquis LED Sign Light was selected as a winner in the 2011 LIGHTFAIR International (LFI) Innovation Awards. 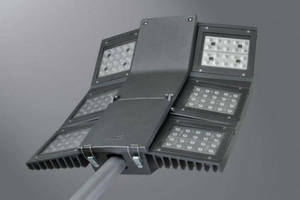 The high-performance LED product from Cooper Lighting, a division of Cooper Industries plc (NYSE: CBE), was named category winner in the Roadway, Sports, Outdoor Architectural and Site Lighting category. The LFI Innovation Awards honor new and truly innovative lighting technologies, products and designs introduced in the past year. Each product is judged by an independent panel of renowned lighting professionals. "We are honored to have our product selected as a category winner in this year's LFI Innovation Awards," said Mark Eubanks, President, Cooper Lighting. "At Cooper Lighting, we continue to develop products that stand above the competition and provide innovative solutions to our customers' lighting challenges. The Marquis LED Sign Light is one that meets that goal by reducing energy consumption while delivering outstanding performance, and we are proud that the judges recognized the product for its design and performance." The high-performance Marquis LED Sign Light was designed to meet stringent roadway sign lighting standards as well as commercial billboard and floodlighting application standards with its unique and innovative optical design that provides even illumination and a preferred warm white color. An ideal solution for both new construction and for one-for-one replacement of existing fixtures, the sign light is available in two lumen packages and has a 50,000+ hour rated life, allowing it to operate six times longer than traditional metal halide 250- and 400-watt sign lighting solutions and offering customers energy savings up to 52 percent. The Marquis LED's modular design and integral electronics allow for the reduction of power consumption without impacting the overall shape or directionality of the distribution, maintaining uniform light levels. The fixture can be mounted to illuminate up or down, making the installation simple regardless of the orientation. The sign light is an energy-efficient solution for illuminating highway/roadway signs, commercial billboards, and additional outdoor façade and building signage applications. Cooper Lighting has made a significant investment in people, resources and technology to ensure the company provides first-class solutions to its customers' lighting challenges, offering a range of indoor and outdoor LED lighting products and corresponding accessories, all of which are specifically designed to maximize energy and cost savings. For additional information, click here. To learn more about Cooper Industries and its comprehensive range of electrical products and solutions, visit www.cooperindustries.com. Cooper Industries plc (NYSE: CBE) is a global electrical products manufacturer with 2010 revenues of $5.1 billion. Founded in 1833, Cooper's sustained success is attributable to a constant focus on innovation, evolving business practices while maintaining the highest ethical standards and meeting customer needs. The Company has seven operating divisions with leading market positions and world-class products and brands including: Bussmann electrical and electronic fuses; Crouse-Hinds and CEAG explosion-proof electrical equipment; Halo and Metalux lighting fixtures; and Kyle and McGraw-Edison power systems products. With this broad range of products, Cooper is uniquely positioned for several long-term growth trends including the global infrastructure build-out, the need to improve the reliability and productivity of the electric grid, the demand for higher energy-efficient products and the need for improved electrical safety. In 2010 fifty-nine percent of total sales were to customers in the industrial and utility end-markets and thirty-nine percent of total sales were to customers outside the United States. Cooper has manufacturing facilities in 23 countries as of 2011. For more information, visit the website at www.cooperindustries.com.